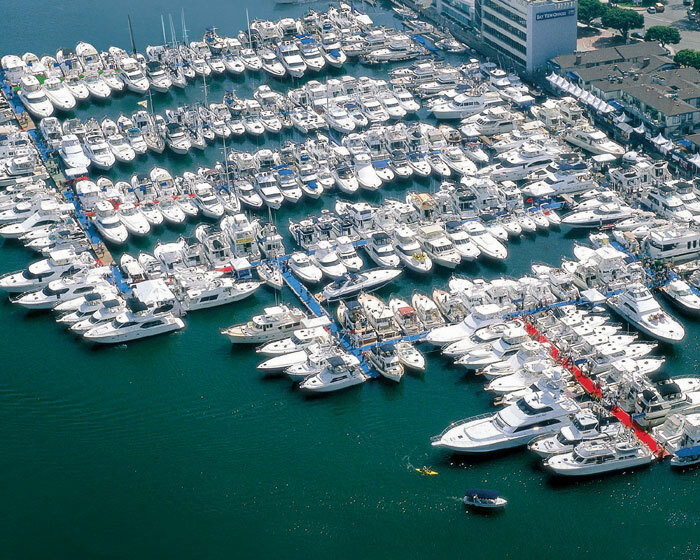 The Newport Boat Show — now celebrating its 40th anniversary — is once again bringing the largest in-the-water collection of big boats west of the Mississippi to Newport Beach, April 18-21. With its enviable location at picturesque Lido Marina Village, this year’s event promises to showcase the finest large yachts in the West, with enough dock space to present more than 200 standout vessels. Whether you’re a new brand-new boater or a savvy, experienced yachtsman — and whether your dreamboat is a serious sportfisher, a luxurious motoryacht, a sporty Med-style express cruiser or a world cruising-capable trawler yacht — the Newport Boat Show has something for you. At the Newport Boat Show, attendees get the rare opportunity to step aboard, inspect and compare the latest yachts from the world’s top builders — along with ocean-tested brokerage vessels that are already equipped with a wealth of custom add-ons, must-have accessories, gear and marine electronics. For those in search of perfection in pleasurecraft, this is a one-stop shopping dream come true. Show-goers can step aboard the most breathtaking vessels on the West Coast in their natural setting — on the water — and see the latest and greatest features that today’s top boat builders have to offer. Even if you’re not in the market for a new boat, the Newport Boat Show is a great place to shop for boating accessories, cutting-edge marine electronics, water-makers, fishing gear, marine engines, generators, tenders and more. And you’ll find a wide array of essential boating services showcased here, including marine financing and insurance. Access to the show is made easier with free parking and shuttle services. Show hours are noon-7 p.m. Thursday, 10 a.m.-7 p.m. Friday and Saturday, and 10 a.m.-5 p.m. Sunday. Admission is $15 (credit cards accepted) for adults and free for children 12 and younger. The Newport Boat Show is produced by the Duncan McIntosh Co. Inc., publisher of Sea Magazine, The Log Newspaper, Boating World Magazine and Editor & Publisher, and producer of the Lido Yacht Expo, Sept. 26-29. For more information, visit newportinwaterboatshow.com or call the Duncan McIntosh Co. at (949) 757-5959.